Do you want to grow plants healthily and consistently even when you are on vacation or away? Do you want your Orchid to grow in a specific and delicate condition without striking a blowing? Now, breeding plants and flowers is no longer a guessing game! 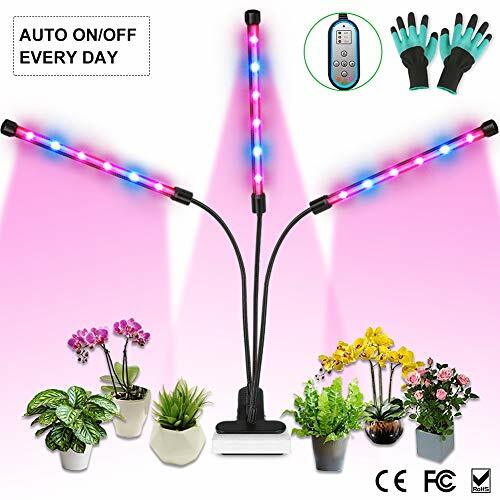 This plant light adopts 18pcs of 2W COB LED(COB: Chip on Board LED is the latest technology), bright and has high conversion efficiency; while others are using 36pcs of 0.5W normal LED, which is not energy-saving and insufficient of lighting. Light is essential at every stage of development. If plants don't get enough light they become weak or even die. Now the grow lamp will save all.
? Improve flower quality and lengthen flowering time, including roses, chrysanthemum, peony, tulip etc.
? Improve the growth and taste of vegetables like tomatoes, chili/peppers, lemon tree, herbs etc.
? Promote the growth of potted plants, such as succulents, ball cactus, aloe plant, burros tail, dudleya etc. HOW DOES THE TWO-WAY TIMER WORK? 2. That's all! 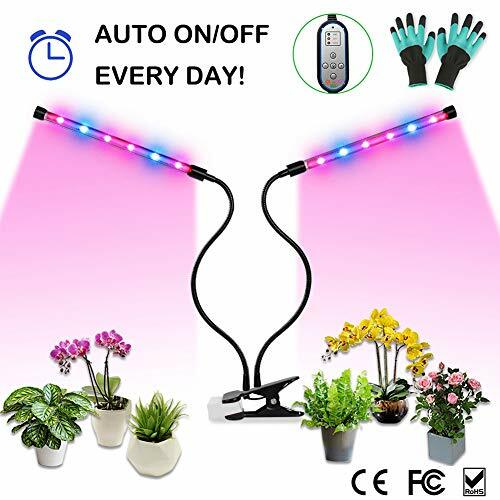 This plant light will auto turn off according to your setting time, then it will turn itself on and off at the corresponding time next day! 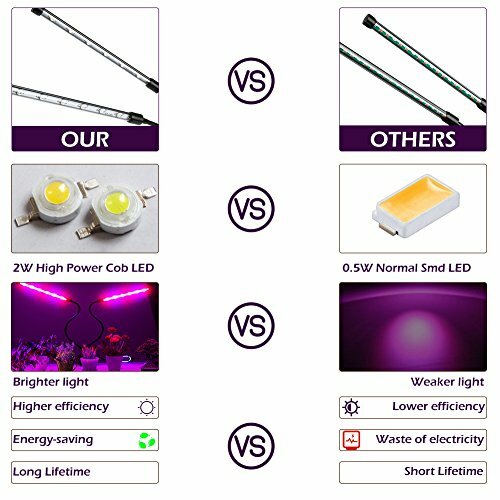 ?BETTER 36W HIGH POWER GROW LIGHT?- This indoor plant light adopts 18 pcs 2W high power COB LED(it is the latest technology in LED), more brighter, but lower heat, has high conversion efficiency, elegant design and space saving; while others are using 36 pcs of 0.5W normal LED, which is not energy-saving and insufficient of lighting. ?8 BRIGHTNESS LEVEL& 3 TIME MODES?- MORE REASONABLE RED/BLUE SPECTRUM RATION provides the most efficient wavelengths of light, perfect for all plants and different stages. 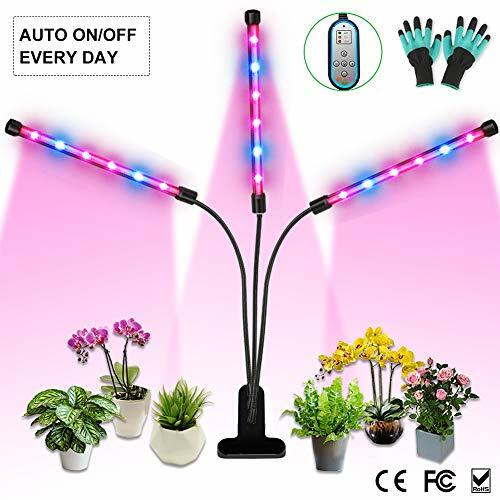 With adjustable 8 brightness level and 4/8/12h time settings, allowing you to optimize light so that your indoor plants will grow stronger and healthier. 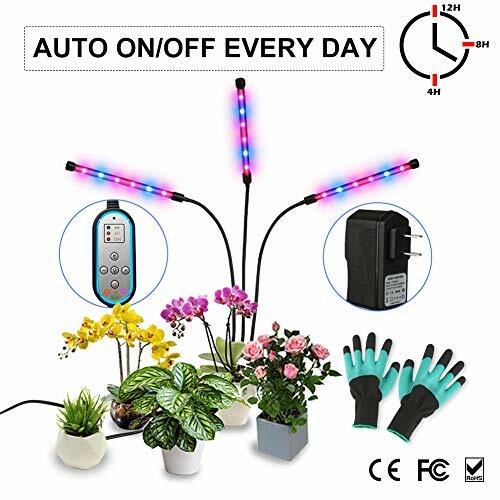 You can also control the quantity of working light head, to suit your Orchid that need specific and delicate conditions. ?MORE WIDER APPLICATIONS?- This triple head lamp with 360 degree flexible neck and sturdy clamp is easy to adjust and place anywhere. The circle light design let it can cover a larger area. Our plant growing light applies to home gardening, balcony, seed, seedling, breeding, flowers, herb, hydroponics, pot plants like succulents, cacti, fruits and vegetables like strawberries, tomatoes and lemon. 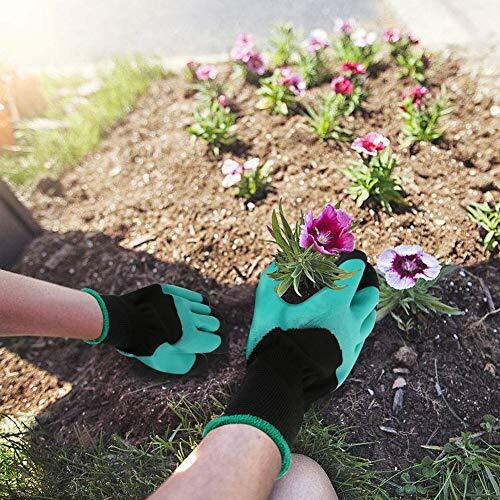 Equipped with GLOVES, great option for indoor garden enthusiasts. ?100% QUALITY GUARANTEE?- FCC, CE, ROHS PSE certified; Standard US plug, 5.7 ft cable length; High quality LED with 50000 hours lifetime; 15 inch swivel gooseneck(longer than others); Sturdy metal clamp; 60 DAYS MONEY BACK policy and 12 months manufacturer's warranty. Any questions, please feel free to contact us. ?PLEASE ONLY PURCHASE FROM MELOPHY OFFICIAL, DO NOT BUY OTHER FAKE PRODUCTS WHICH ARE SELLING IN THIS PAGE, THESE ARE FAKE AND LOW QUALITY? ?2018 UPGRADED AUTO ON/OFF TWO-WAY TIMER?- If you are looking for a plant grow lamp which is great and convenient to use, look no further! Our newest LED grow light has a patented circular memory timing function, set up once and it will auto turn on/off EVERY DAY! NO MANUAL OPERATION! Let it take care of your lovely plants even if you are on a vacation!